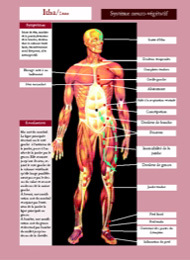 «1- Sensip are energy lines which follow muscular-tendon lines. 2- The primary aim of working on sensip is to release myofascial tensions. As far back as memory goes, Thaïs have been rice growers and irrigators. Their mode of thinking is concrete. Is a strip of rice field drying out? An upstream canal gate is opened. If water is too stagnant, a downstream water-gate is opened. They know to conserve their energy for the long run. physical condition of the treated patients improves spectacularly. 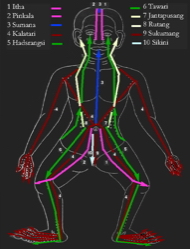 acupuncture, but for mobilization and muscular pressure preceded by search for the causes. The Thaï viewpoint depends on tangible effects. Anticipating the felt affect and a sort of « muscular empathy » are both part of an ancestral instinct accumulated from one generation to another which give Thaï bodywork its own characteristics. rhythms originating in Theraveda Buddhism - diffuse implicit kindness (Mitta) in treating affects and clever integration of gravitational effects to attain greater results with less effort. Dr Pennapa Subsharoen, President of the Institute of Alternative and Traditional Medicine in Thaïland has inspired much experimental research on the efficacy of NB. She is also a member of the consultative Committee for evaluation of traditional medicines at the World Health Organization. Ms. Susharoen, member of a family of traditional Thaï doctors and a medical doctor herself, graduated from the University of Songla to become a doctor in Public Medicine with a thesis on the traditional Thaï health system. In defining sensip work, she writes: (It is) « To feel the muscles the length of the disturbed lines and healing by applying pressures of varying intensity which brings back harmony ».